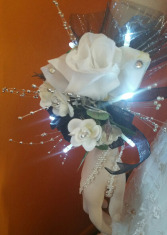 Bouquet is a simply gorgeous way to extend your merriest holiday wishes! 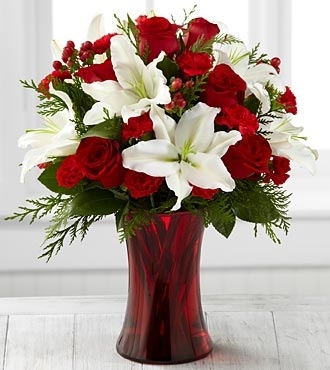 Rich red roses are paired with white Asiatic lilies and accented with variegated holly and holiday greens, beautifully arranged in an exquisite designer red glass vase to create an elegant expression of holiday cheer and winter warmth. GOOD bouquet includes 5 stems. 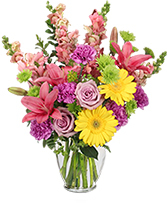 Approximately 19"H x 14"W. BETTER bouquet includes 8 stems. 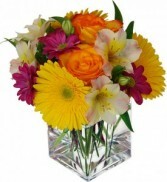 Approximately 20"H x 16"W. BEST bouquet includes 11 stems. Approximately 21"H x 17"W.